Begun as a story by story blog of my 'Journey Through the Whoniverse' (see my Starburst Magazine column for era by era updates) this is a Doctor Who review blog. If you haven't seen any of the stories then beware the dreaded SPOILERS. If you want detailed reviews this ain't the place. These are more spur of the moment instant judgements focusing on what gets my attention. I hope you like it. The Twin Dilemma has its negatives. Lots of them. There is one of the worst villains in Doctor Who history: Mestor the giant cross-eyed slug. Battling away with The Myrka & that bloody giant prawn from The Invisible Enemy as part of the cavalcade of the unloved. Mestor is richly voiced by Edwin Richfield, a British television regular whose face you would know, even if the name means nothing and here he is dressed as a giant slug working bloody hard to be a convincing threat. It is no shame on Richfield that Mestor is about as threatening as a marshmellow. It's the design. If your monster can't walk unaided then I'd suggest you are on something of a loser. The script by Anthony Steven isn't great & the direction, particularly after Graeme Harper's sterling work on Androzani, is postively pedestrian. Nicola Bryant does a generally good job to, especially her dislike of this new person clumping about the TARDIS trying to strangle her. Kevin McNally does a fine job of being sarcastically heroic as Hugo Lang. Praise also for Barry Stanton (Noma), Seymour Green (Chamberlain) & Oliver Smith (Drak) who do a fine job as bird-ish Jacondans. Noma's a git, the Chamberlain is a creep & Drak a doomed hero & all give their characters a certain panache. 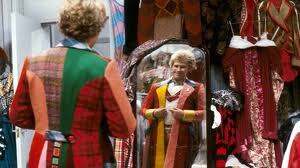 Also unlike the terrible Mestor costume, the designs for the Jacondans look lovely: feathers, silver skin & beaky noses.